Remember that famous line in that classic Christmas movie “ every time you hear a bell, an angel gets their wings”! Well this little angel has bells on her wings. Her body is muslin that is painted and stained. Face is needle sculpted. Her shoes are painted and laced with embroidery floss. 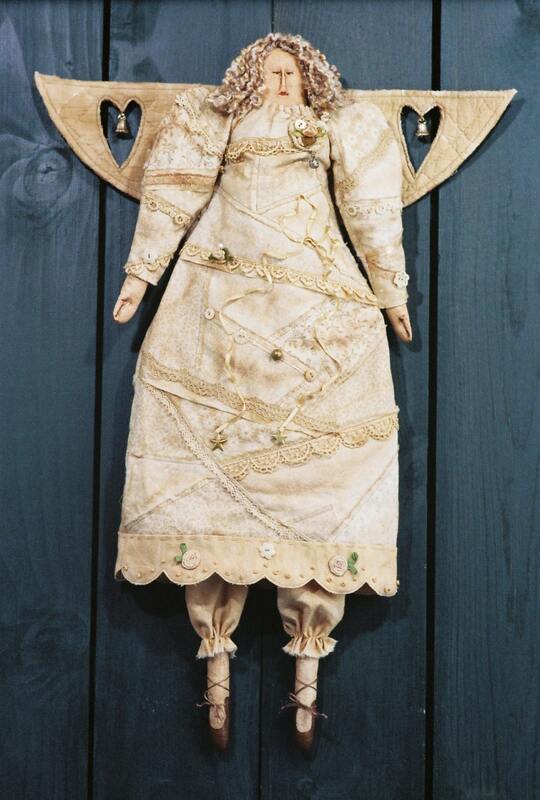 Her wings are pre-quilted fabric with cut out hearts and bells hanging from the centers of the hearts. Her dress lined with flannel and is faux crazy quilted. The dress is adorned with laces, ribbons, silk flowers, buttons and charms. Easy to make. nstant PDF download includes easy to follow instructions, doll and clothing pattern and a complete suggested materials list. I love her pretty dress and wings.